After working with fabrics for many years, I decided to give free rein to my love of textile art and my freedom to create. I began to work with all types of fibres, mainly of animal of vegetal origin but also with some synthetics and a wide variety of materials. I use them as a painter uses his palette of colours: playing with them, cutting them, transforming them, mixing and blending them, layering and shaping them, and then sewing and embroidering them by machine. The materials then take on a different form and at the same time reveal themselves - I have created a new fabric. 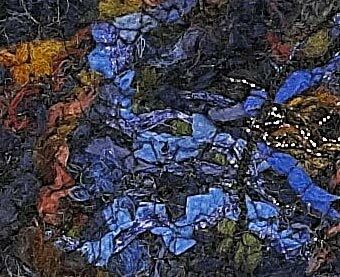 The texture, the colour and the feel of the fibres speak to me, giving me the inspiration to create something new. Textile art has existed for over 20,000 years. "Most peoples have used fabric as a way of conveying social and cultural messages". In western society, textiles were frequently seen as the only method of artistic expression open to women in the home. In fact, women immersed themselves in the ancient methods of popular European art or the ancient American Indian cultures, finding them to be tremendous, powerful method of expression. At the beginning of the 1960s, a major feminist movement attempted to return this art to its former glory, proclaiming that a piece of woven fabric was, in itself, a work of art. Thanks to its originality, textile art permits numerous experiments.